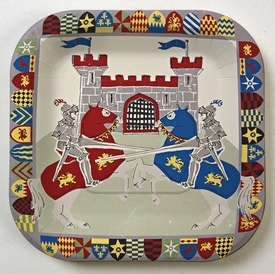 A brave knight square format party plate with heraldic shield border and illustration of jousting knights with lances. Each package contains 12 plates. NOTE: Only 8 packs left! SIZE DIMENSIONS: 7 3/8" x 7 3/8"